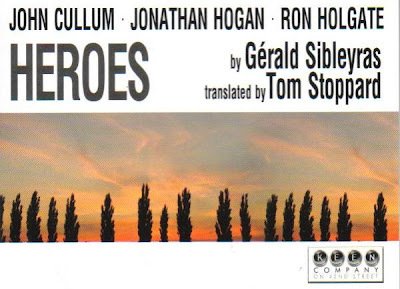 On Friday night, I caught the Keen Company's new production of Heroes at the Clurman at Theatre Row. The 90 minute one act play was written by Gerald Sibleyras and translated by Tom Stoppard. It's an intimate comedy about three old veterans of World War I, living out their days at a refuge. Fighting boredom and ailments, they begin to dream of breaking out for one last valiant operation. The operation is impossible and while they each realize it, only one voices apprehension. Eventually he plays along too because he sees the value in the dream. In the end, the plan of the operation is enough. It was light, at times baudy, entertainment and I loved seeing the three old men on stage. John Cullum, Jonathan Hogan, and Ron Holgate play the old vets. Virilent Ron Holgate stole the show. It was fun seeing John Cullum knowing that he is concurrently playing in the first scene of August: Osage County on Broadway. The Clurman is on 42nd street, so he has plenty of time to leave The Music Box on 44th and get to his place for the 8:30 curtain of Heroes.